Mersal has Thalapathy Vijay playing triple roles, first time in his career – a doctor, a magician and a village head. Actor Vijay’s most celebrated film, Mersal, will be hitting the screens tomorrow, October 18th, 2017 worldwide. 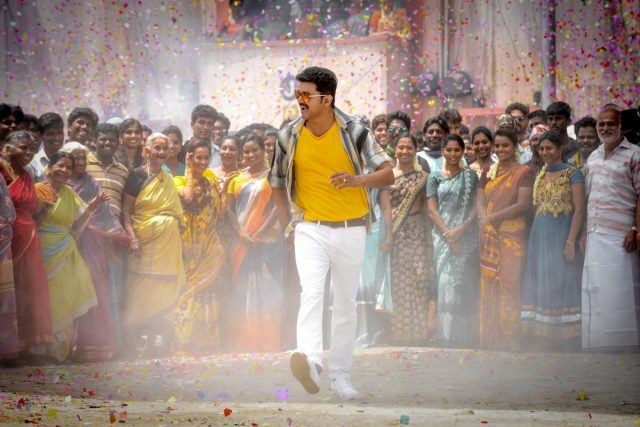 The film has managed to garner huge buzz around it courtesy the combination of Vijay and Atlee. The duo had delivered the hit film Theri the last time they came together and the expectations on Mersal are similar again. The interesting thing about Mersal is that the screenplay of the film is co-written by Baahubali and Bajrangi Bhaijaan writer K.V.Vijayendra Prasad which makes it more exciting for the fans. And with so much excitement and buzz around the film, the expectations from the producers on the film would be high too. And not disappointing them there, Mersal pre-release business is said to have already earned a staggering amount of INR 150 crores. According to reports, the satellite rights and the theatrical rights of Mersal so far stand at a whopping INR 150 crore mark. This means, the collections at the theatres too have to be better than this if the distributors were to make profits from the film. And the producers are confident that the film will be more than just being profiting to the distributors and many other involved, reports suggest. Mersal has Thalapathy Vijay playing triple roles, first time in his career – a doctor, a magician and a village head. Mersal also stars Samantha Ruth Prabhu, Kajal Aggarwal and Nithya Menen as the leading ladies while SJ Suryah wil be playing the antagonist in the film. Veteran Vadivelu is said to be playing an important role in Mersal, which will be after a long time.